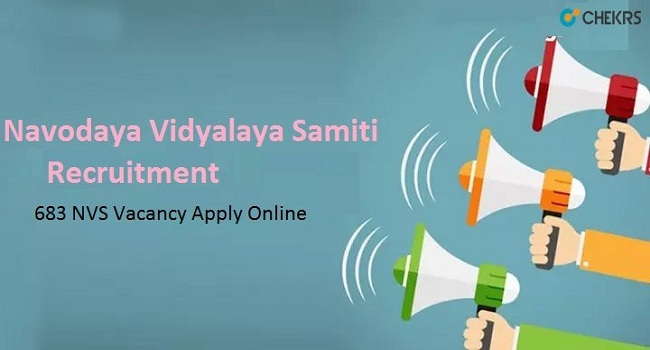 Navodaya Vidyalaya Samiti Recruitment 2019 (नवोदय विद्यालय समिति भर्ती 2019 एनवीएस नवीनतम नौकरी रिक्ति) NVS invites online applications from Indian citizens for recruitment to various non-teaching posts viz Female Staff Nurse, Catering Assistant, Lower Division Clerk/ Storekeeper, Lab Attendant in Jawahar Navodaya Vidyalayas and for the posts of Audit Assistant, Hindi Translator, Stenographer, Lower Division Clerk in NVS HQ / Regional Offices. Interested candidates can apply for the NVS Staff Nurse Vacancy 2019. Latest Update: NVS is going to release the Navodaya Vidyalaya Samiti recruitment 2019 notification for various non-teaching posts. Interested aspirants can fill the application form before the last date from here. Before the last date of Navodaya Vidyalaya Samiti Application Form, they must complete all tasks through the online mode. Candidates can bring all details of NVS LDC Recruitment 2019 by the NVS Recruitment Notification. NVS invites online applications from Indian citizens for recruitment to various non-teaching posts. Application formats along with all relevant information are available on the official website of Navodaya Vidyalaya Samiti. Applicants check all details about the NVS Stenographer Recruitment Online Application and finish this process on or before the last date. From here, you can also apply for Latest Government Jobs. candidates are informed that the candidates should take a printout of the online application, affix a recent passport size photograph and preserve it with them for their record and should not send the same at NVS or any other address. Candidates are informed that who had applied earlier for these posts in response to notification published by the NVS HQ for the NVS Hindi Translator Vacancy and its Regional Offices concerned are informed that applications of eligible candidates have been integrated with this recruitment drive on some eligibility criteria and conditions against which they have applied. Applicants who want to apply for Navodaya Vidyalaya Samiti Audit Assistant Vacancy can check their eligibility before completing the application process. Hindi Translator Graduation or Master’s Degree from the recognized University in Hindi / English with other languages than a Master’s Degree at graduation level. Stenographer Senior Secondary School Certificate (Class XII) and Shorthand speed of 80 words per minute and typing speed 40 words per minute in English. Or Shorthand speed of 60 words per minutes and typing speed of 30 words per minute in Hindi. Lab Assistant Middle Pass with General Science. Candidates are required to apply Online through NVS website. If candidates will old then click on the provided link. Click on the I Agree checkbox then click on Already Registered Candidates-Click Here to Login button. Enter the User Id and password and complete the application form. For the Fresh Candidates click on the available link. Click on the I Agree on checkbox button and click on Start Button. Complete Registeredistred Forma and after complete or note down the User ID and Password. log in with these details and complete the application process. Take a print out of application form for the further uses. To know more about the NVS Recruitment 2019 candidates can get information through www.jobs.chekrs.com website. If you have any query about Navodaya Vidyalaya Samiti Recruitment that you can write comments on the commenting box and take a review or feedback.